Episode 6 is titled ‘Spies Like Us’. We learn even more about Huck’s past and the people he used to work with, and with Olivia’s help he fights to keep his identity a secret. Olivia asks Harrison to break Abby and David apart, and Cyrus’ husband James writes an inflammatory newspaper article about Hollis Doyle. The Scandal of the Week surrounds Huck’s past- he used to work as a spy for B6-13, a top secret group funded by the CIA. Crosby, the guy who ran the group, stuck a package addressed to Olivia in a mailbox and then shot himself in the head. Once the package arrives, Olivia opens it and sees a coded sheet of music. Huck cracks the code and realizes he and the other 5 spies are in danger- a hacker named Nigel is threatening to expose them. Olivia knows Nigel doesn’t have the names yet or he would go ahead and release them. She suspects one of the spies is the leak, and she tells Huck to bring all of them into the office. All of the spies have active, normal lifestyles. They are a teacher, mom, spouse, doctor, etc. but in their core they are still spies, and they quickly determine that there’s a rat in the room. They all pull guns on each other while waiting for someone to confess. Meanwhile, Olivia talks to Nigel’s attorney. He tells her Nigel has transferred money to a Swiss bank account and he’s waiting for the spy to receive the money and send the names. Huck reveals the bank account number to the spies, and they all remember earlier when the Doctor Spy was on the phone earlier and he gave a ‘prescription number’ which exactly matches the bank account number. Immediately all of the spies turn their guns on the Doctor, and finally the Mom Spy pulls the fatal shot. The spies work together to clean up the crime scene and get rid of the body. Harrison intercepts the package with the spies’ names in it, and once again Olivia and the team have saved the day. It’s been a long day for Huck, but at least his identity is still protected. Credit: ABC/Vivian Zink. David and Abby are still going strong at the beginning of the episode and Olivia is still listening to their conversations in David’s apartment. Turns out I was wrong and he really does care for Abby- he offered to clear out a drawer for her to use. Aw! 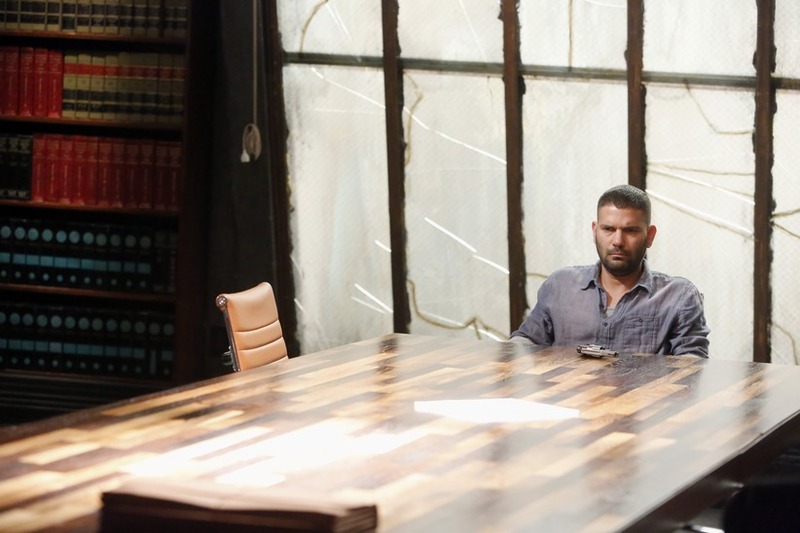 Harrison confronts Olivia about the weird stuff going on in the office, like Abby dating David Rosen, Quinn’s dual identities and Huck’s spy problem. He says Olivia is trying to tackle too much on her own, and he wants to help. She asks Harrison to break up Abby and David, and she tells him that Abby was physically abused by her ex-husband. Harrison runs into an ex of David’s, and he pays her to meet with Abby and tell her that David used to abuse her. After the two women meet, Abby finds out that David knows about her past abuse because he did a background check on her. She breaks up with him, and then confesses to Olivia about their relationship. Harrison is fed up with the weird stuff going on at the office. He tells Olivia that he will help her with whatever she needs. Credit: ABC/Vivian Zink. James, Cyrus’ husband, writes a mean article about Hollis Doyle, where he basically accuses Doyle of being a liar and a cheat, and everything else except a child of God. Cyrus angrily tells James that he can’t write about a ‘source’ who feeds him information because everyone will think that source is Cyrus. Hollis Doyle shows up at Cyrus’ office and tells him to silence his ‘wife’. Olivia tells Cyrus that eventually James’ life will be in danger if he keeps snooping around and gathering info on Hollis. Cyrus turns on the fake tears and tells James that the article has put his job in jeopardy. James falls for it, apologizes for almost getting Cyrus fired and promises to stop writing about Doyle. Cyrus breathes a sigh of relief after James leaves the room. 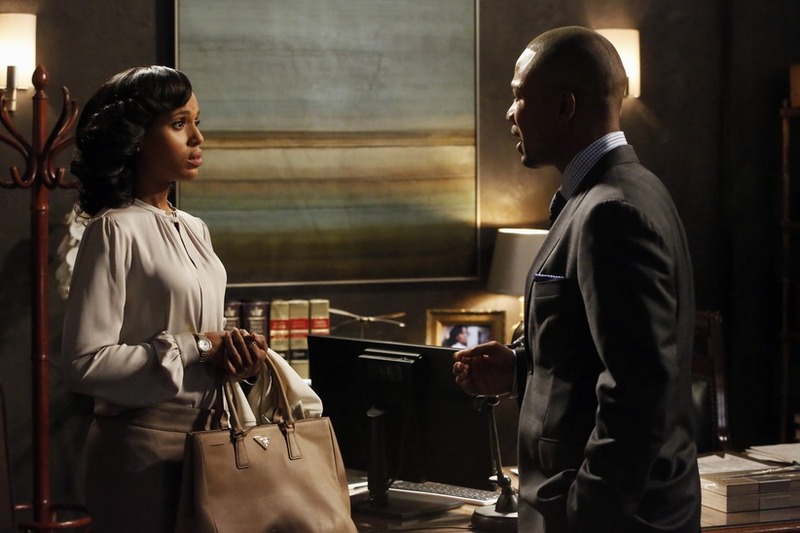 Throughout the episode Senator Davis made repeated attempts to get together with Olivia again. Well, mostly he wants her goodies. Towards the end of the episode he shows up at her apartment and Olivia starts to break down because of her recent actions that required lying, breaking people apart, and spying just to keep secrets intact and to keep people safe. It’s more than she can bear. In a moment of weakness she passionately kisses Davis and he goes into her apartment and closes the door. In my opinion this episode didn’t measure up to the drama of the previous ones. The Huck situation was very entertaining because it’s always great to see into Huck’s past. I also think it’s sweet to see how much Becky means to him. Even though Olivia and Fitz have separated and Abby and David are broken up, I suspect both couples will try to work it out at some point this season. What do you think?